MOPTI, Mali — Bawba Mint Baba Ahmed’s sewing teacher singled her out in front of the class, telling her: “You look like a rebel.” Others threatened to slit her throat, she says, drawing a finger across her neck. Now the 29-year-old has dropped out of school and spends her days hiding inside her mud-walled home with her mother and two sisters, fearing retaliation from those who accuse her of being an Islamist simply because she is Arab. As the French and Malian forces oust al-Qaida-linked militants from the towns of Gao, Timbuktu and Kidal, ethnic tensions exacerbated by months of political upheaval are putting Mali’s minorities in danger. 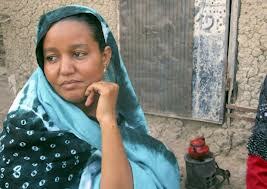 Most members of the Islamic groups that took over last year are from Tuareg and Arab ethnic groups. Northerners living in the central and southern parts of Mali say they have faced discrimination and fear of reprisals by those who blame the country’s problems on anyone who looks Tuareg or Arab. Less than 15 percent of Mali’s population of some 16 million are Tuareg or Arab, and the vast majority live across northern Mali. Activists also fear that as tens of thousands return home to the north, there may be more such attacks against those suspected of links to Ansar Dine or NMLA — a secular Tuareg rebel group. “Given its history and this high level of ethnic tension, we’re really concerned that as local populations who suffered tremendously under the NMLA and the Islamists return to their towns and villages in the north that the incidents of reprisals could dramatically increase,” said Corinne Dufka, a senior researcher with Human Rights Watch. Already in the town of Gao, she said, there have reports that people have targeted the homes of individuals who either housed Islamist fighters or are accused of collaborating with them, notably Arab traders. 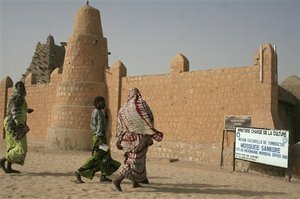 AP Photo – People dressed in colorful dress walk near the Sankore Mosque, a United Nations world heritage cultural site, which would not be allowed under the rule of Islamic militants who ruled the city until French troops took control, in Timbuktu, Mali, Thursday Jan. 31, 2013. Many things have changed in Timbuktu since French troops parachuted in several days ago to take control of the area from Islamic militants, and now there is a growing sense of freedom. And in the market of Timbuktu, over a dozen shops owned by the city’s Arab population have been gutted, pillaged by the population because the town’s Arab citizens were suspected of having been allied with the Islamists. Malian military forces are also facing accusations of targeting Tuaregs and Arabs especially in the last month. International human rights group have expressed concerns about soldiers attacking civilians, including violence directed toward Tuaregs and those suspected of links to the Islamists. One witness told The Associated Press last month that he saw soldiers kill three men in Sevare, including an older man with a beard who had been reading the Quran at a bus stop. The country’s current chaos began a year ago when Tuaregs from the north who have long sought autonomy launched another rebellion. Backlash against Tuaregs and other light-skinned northerners soon began, and only intensified after radical Islamists took advantage of the chaos to seize northern Mali and implement a harsh version of Islamic law known as Shariah. While most of Mali’s Arab community lives in the north, the family of Bawba Ahmed, the woman who dropped out of her class, has lived in the central town of Mopti since 1963 — almost as long as Mali has been an independent nation. Last year, Bawba fled to neighboring Burkina Faso with her mother and sisters 21-year-old Aguida and 33-year-old Mounaicha out of concern for their safety in Mopti. They rented an apartment there for about a month, but decided to come back as money ran low and those in Mopti reassured them things were getting better back home. Now they rarely venture outside, fearing attacks from unruly Malian soldiers patrolling the area or neighbors who view them with suspicion. “There are certain neighbors who are kind and have protected us and others who have not,” says Fatouma Arby, the 72-year-old matriarch of the family, dressed in a black robe and headscarf. The four unmarried women survive off only their small herd of livestock — including two sheep tied to trees out front and a pile of baby goats sleeping in the shade that they can sell one by one for cash. I don’t understand the viewpoint of these blue ones, why do they have commerce with the Arab interlopers? Business, Patience. Nothing wrong with sales. Some sell their souls to keep the money flowing, or to keep a business running. Others just attempt to ‘blend in’, but to do business the same, and survive. Neither is a direct danger, or part of the reason that people are killed by the power-hungry idiots. Losing customers is not good for business, generally speaking. The French or the UN may need to keep a presence for a long time just to get the ‘reprisal’ mentality of other idiots down to levels where business can again be done. By ALL ….